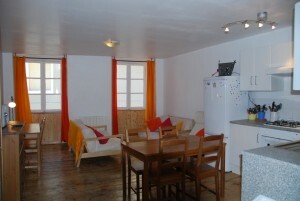 This is a three bedroom apartment in the old town of Briançon for 8 people. 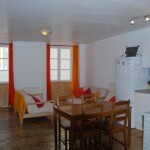 This old house in the heart of the Ville Vauban, once an old coaching inn has been refurbished to provide comfortable accommodation for your holiday. This flat is in the converted loft space. There are 3 bedrooms, one with twin beds and the other two with a double and a single bed. Each bedroom has its own shower and washbasin, and there are 2 WCs. The entrance hall gives hanging and storage space. 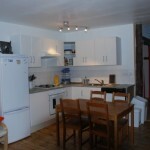 In the front of the house the main room contains a fully equipped kitchen and dining area, the lounge has TV/DVD.